Types of Portrait Art During the Twentieth Century. by the leader of Die Brucke.  For the 50 Best Portraits, see: Greatest Portrait Paintings.  For the greatest portraitists, see: Best Portrait Artists. The Prophet (1912) By Emil Nolde. 20th century art turned away from classical or formal portrait art and focused instead on new ways of presenting reality. Portraits became merely another genre which artists used to promote a particular style of art. The most famous portraitists of pre-war Europe belonged mostly to either the Ecole de Paris (Paris School) or the German Expressionism movement. The main styles of French painting included brightly coloured Fauvism, the more cerebral Analytical Cubism, and general forms of Expressionism. German artists were also strongly influenced by events in Paris, although they developed a separate style of portrait prints, including woodcuts - see, for instance, Emil Nolde's The Prophet (1912, Museum of Modern Art, New York). For more about 20th century portraits, see: Analysis of Modern Paintings (1800-2000). The most famous Paris-based artists - all of whom produced masterpieces of portraiture - included: the Fauvists Henri Matisse (1869-1954) [Woman with a Hat, Portrait of Madame Matisse: the Green Line], Kees van Dongen (1877-1968) [Woman in a Black Hat, Le Coquelicot]; the Expressionists Modigliani (1884-1920) [Portrait of Juan Gris, Portrait of Jacques Lipchitz and His Wife, Portrait of Jeanne Hebuterne, Girl with Braids], Georges Rouault (1871-1958) [The Old King], Chaim Soutine (1893-1943) [Portrait of Madeleine Castaing], and the Cubists Pablo Picasso (1881-1973) [Boy with Pipe (1905), Portrait of Gertrude Stein (1906) Portrait of Ambroise Vollard (1910), Woman in White (1923)]; and Juan Gris (1887-1927) [Portrait of Pablo Picasso]. 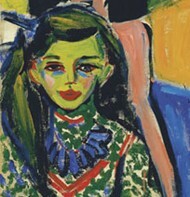 In Germany, the greatest portraitists included members of the Dresden/Berlin Die Brucke group (1905-13), such as Ernst Ludwig Kirchner (1880-1938) [Franzi in front of a Carved Chair] and Emil Nolde (1867-1956); members of the Munich Der Blaue Reiter group (1911-14), including: Alexei von Jawlensky (1864-1941) [Head of a Woman] and Gabriele Munter (1877-1962) [Meditation]; members of the 1920s Die Neue Sachlichkeit group such as Otto Dix (1891-1969) [Portrait Of The Journalist Sylvia Von Harden]; and the Austrian expressionists Egon Schiele (1890-1918) and Oskar Kokoschka (1886-1980). The social and moral upheaval caused by the catastrophe of World War I had a major effect on fine art painting. In particular, it undermined the tradition of figure painting and figure drawing, and abstract art began to dominate all genres, including portraiture. See for instance, Weeping Woman (1937) by Picasso. This trend strengthened further after World War II, as abstract expressionism took hold in New York - the new capital of world art. But see de Kooning's Woman series, which opened with Seated Woman (1944). 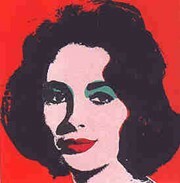 Not until the Pop Art movement did representational art make a significant reappearance. Another important trend which emerged during the 1960s in America, was Photorealism (also known as hyperrealism or superrealism). Members included the highly innovative portraitist Chuck Close (b.1940), who became famous for his huge self portraits. For more examples of Pop and Photorealist portraiture, please see: Contemporary Portraits. In addition to artists from these specific schools, the twentieth century saw the emergence of several individual portrait painters, such as the versatile Graham Sutherland, the expressive surrealist Francis Bacon, the classical Lucien Freud and the famous "impastoist" Frank Auerbach. An early Neo-Romantic landscape artist, Graham Sutherland took up portraiture after the war. His most famous paintings included: Portrait of Somerset Maugham (1949) and the controversial Sir Winston Churchill, which was commissioned in 1954 and later destroyed. Deeply influenced by Surrealism, as well as the apocalyptic images of Edvard Munch, William Blake and Hieronymous Bosch, Francis Bacon produced a number of nightmarish portraits hovering between control and fear. His works include: The Screaming Pope (1953) - based on Velazquez' Portrait of Pope Innocent X - Portrait of George Dyer Talking (1966), and Portrait of George Dyer in a Mirror (1968). For more details of Irish portraiture, see Irish Portrait Artists. Grandson of Sigmund Freud, the artist Lucian Freud was one of Britain's most active artists. His main subject was the human figure, and his raw, naturalistic style of figure painting depicts the human body and face in all its unique contours, lines and individual detail. He painted people "not because of what they are like... but how they happen to be." Among his huge output of portraiture and life-like figure paintings are: Naked Man With Rat (1977), The Painter's Mother (1984) and Benefits Supervisor Sleeping (Portrait of Sue Tilley) (1995). Frank Auerbach, the highly respected German-born British semi-abstract expressionist, trained at the Royal College of Art before becoming famous for his heavily impastoed portrait paintings. Held at the National Portrait Gallery in London, in 2000, this exhibition celebrated a century of portraiture by featuring one portrait from each year of the 20th Century. Among the galaxy of subjects painted, were: the Soviet leader Lenin (by Isaak Brodsky), a self-portrait by Edvard Munch, the poet Anna Akhmatova (by Kuzma Petrov-Vodkin), the Pop Artist Andy Warhol (by Jean-Michel Basquiat), the actor Charlie Chaplin (by Fernand Leger), the writer Somerset Maugham (by Graham Sutherland), the writer Edith Sitwell (by Pavel Tchelitchew), the rock star David Bowie and his wife Iman (by Stephen Finer). Other portraitists shown included: Salvador Dali, Otto Dix, Amedeo Modigliani, Oskar Kokoschka, the Impressionist John Singer Sargent, Pablo Picasso, the Expressionist draughtsman Egon Schiele and the English painter Walter Sickert. The next article covers Self Portraits.  For more about 20th century portraitists, see: Homepage.